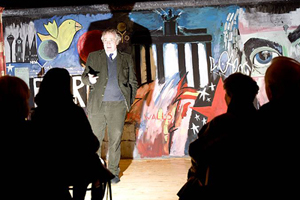 Our set design team seem to raise the bar higher at each talk and their version of the Berlin Wall proved a sensational back-drop to a talk on thriller-writing on Friday, January 23rd given by Henry Porter, one of the world's most successful writers in the spy-thriller genre. Henry's last best-seller, called Brandenburg, has just been voted the best thriller published in France in 2008 by a panel of estemmed judges from a combination of the French equivalent of BBC Radio 4 and the Times Literary Supplement. The same panel also voted it one of the best 20 novels published in France last year in all categories. Brandenburg is set at the time of the fall of the Berlin Wall and so we felt it appropriate to construct our version, complete with spot-lit branches to create an eerie effect.. The plaster-board wall itself was built by Andy Warner, whilst Marlene Fisher, our chief set designer, sourced some photographs of the original graffiti on the wall, which came down 20 years ago this autumn. The painting was undertaken by Vee Colditz, a German artist living in Wootton, who has worked on the sets for the James Bond films at Pinewood Studios. Vee brought along two of her fellow artists to complete the recreation of the graffiti in the space of just a few hours. During an item on the Wootton Talks on Radio Oxford, the presenter commented on the large number of talented people in Wootton and this provided even more evidence, if any were needed. 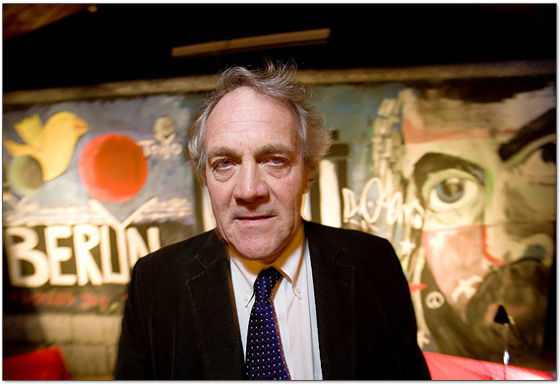 Henry, who has written four thrillers and one children's book, was delighted at the "Berlin Wall" and it provided the setting for his fascinating talk, which focused on the art of thriller-writing when intensive and detailed research are entwined with fiction. He also spoke passionately about the effect that the crumbling of the Wall had on people who had never tasted freedom in their lives and the intoxicating feelings it prompted. He also spoke movingly about those former East Germans who had spied for Britain but refused to take any final payment because their motivation was not financial, but simply the pursuit of freedom. Henry's talk also embraced his other passion - erosion of civil liberties, ID cards, surveillance and the powers of the state and a packed house was left in no doubt as to how much he feels the state now has access to our most intimate details and how it has passed legislation (almost furtively) which will lead to extensive monitoring and recording of people's movements and profiles. Henry Porter's talk was fascinating and took us into the shadowy world of spies behind the Iron Curtain before the Berlin Wall came down . The fact that he was actually there when it happend added great realism - Miles Tuely. Speaking in front of a spectacular backdrop of our version of the Berlin wall, Henry Porter masterfully combined insights into his approach to thriller writing with some fascinating anecdotes. It was particularly illuminating to learn of the difficulties that face a writer’s imagination. Henry paid reverence to life’s ability to conjure up stories that are beyond fiction. He then went on to explain that the writer’s art lies principally not in the events but in the detail. Such details have been handsomely supported by real life events and Henry did not fail to satisfy our enormous appetite for great stories of daring-do during the cold war. The excellent talk ended with a thought-provoking discussion on our so-called inalienable rights to personal freedom which are slowly being eroded in a surge of legislation - Anthory Shepherd.